Gareth Hardware, Head of Horticulture at the Commonwealth War Graves Commission (CWGC), Western Europe Area (WEA), based at Beaurains, Arras, invited us to visit Villers-Bretonneux and Thiepval to see the current progress of the works there. Martin and Beatriz Lutyens, Rebecca Lilley and myself, representing The Lutyens Trust, enjoyed a convivial dinner in Arras with him and we were joined by, from England, David Richardson, Director of Horticulture, and Jonathan Gedling, Director of Works. Our next day began with a glimpse of Lutyens’s Serre Road No 2 cemetery with its very fine entrance pavilion — his second largest cemetery in France, completed in 1934 — en route to Villers-Bretonneux to see progress on the new Sir John Monash Visitor Centre being created by the Australians in time for Anzac Day in 2018. Here we met up with Django Maekelberg, Head of Works WEA, and his colleague Sarah Camerlynck, Conservation Supervisor WEA, both from Belgium. Our first sight was a rather uninspiring new reception centre adjoining the car park. 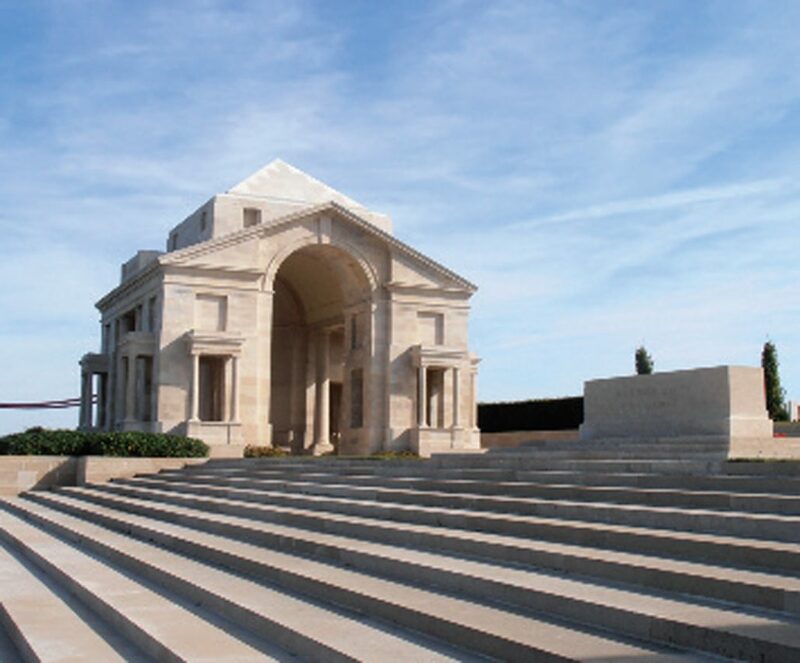 But we soon moved on to the two exquisite pavilions by Lutyens flanking the entrance to the Villers-Bretonneux cemetery, where we learnt that they were built circa 1928, so predating the memorial itself (inaugurated in 1938). Gareth led a discussion about revisions to the planting round the pavilions and new access arrangements for visitors. When the subject came up of benches where they could pause and rest beside the side buildings at the junction of the cemetery and the memorial, we suggested that simple stone slabs would be an economical and long-lasting option. At Lutyens’s memorial itself, the project’s Australian architect explained that the entrances to the ramped paths leading to the new centre being built behind the memorial — and thankfully thus concealed from the cemetery — involved cutting through the rear walls of both Lutyens’s fine side pavilions here. Martin protested at this interference with these buildings which ought to be sacrosanct, and proposed that the new entrances could easily be sited so as to circumnavigate the pavilions as there is plenty of room to do this. The architect took this point on board but we were not convinced that it would be taken seriously. If this plan were to be implemented, we pressed that, at the very least, the alterations be clean-cut, rather than disguised by using pastiche mouldings on the cut surfaces to suggest that the new openings were original. We then visited the new centre, a gigantic building where lavish expenditure was the order of the day. But we were shocked by its appearance: it was hardly contemporary in style and seemed not as sunk enough into the ground as previously supposed. It was a relief to get away from it for refreshments at CWGC’s discreet new premises, which have replaced its ugly old shed. We had a sandwich lunch at La Neuville British Cemetery, remote in the fields near the village of Corbie, where Lutyens’s elemental pavilions are reminiscent more of architect Charles Holden: a small, moving place, surrounded by beech hedges and graced by two splendid pagoda trees (Styphnolobium japonicum). Arriving at the Memorial to the Missing of the Somme at Thiepval, the horticulture team told us about the wear to the lawns caused by so many visitors, and we suggested that new wider paving at the foot of the memorial might provide a solution. As for replacing the original side walls leading to the memorial and at its circular intersection, removed during renovations of the 1960s, it was clear that there would never be a budget to reinstate them. We did not agree with the proposed economical idea of substituting them with hedges to suggest their paths. After all, the memorial has evolved for economic reasons; we felt this was part of its history and that it was better not to introduce new features. An exception might be made for a beech hedge tracing the line of the circular wall which originally surrounded the intersection. This would discourage visitors from wearing a path across the green sward by cutting the corner on the way to the memorial, as they do now: and would guide them to approach the memorial head on, as intended. 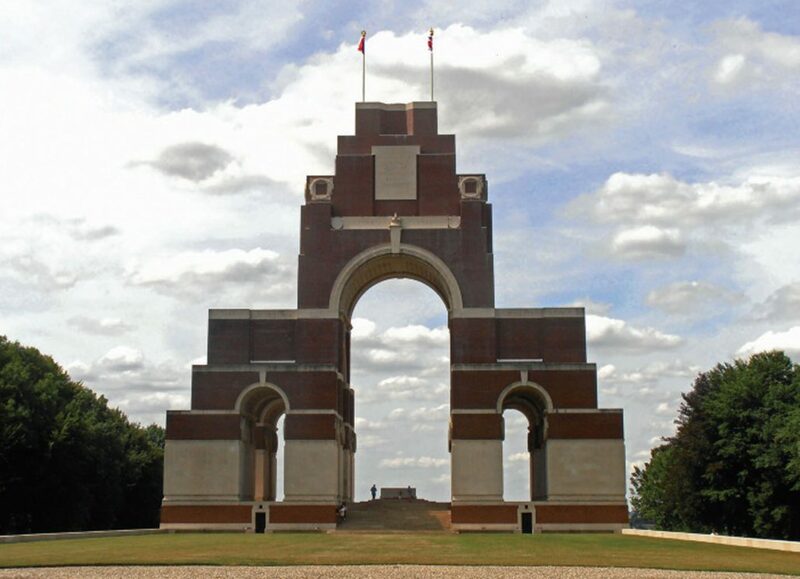 We then entered the memorial itself, looking at its vast subterranean spaces before climbing a series of spiral staircases to the cavernous room above the main arch, then on up to the roof with its panoramic view of the battlefield. Django, meanwhile, explained the massive conservation project involved, carried out over the previous two years, to restore worn brickwork and remedy extensive water penetration and drainage problems. Our last stop was at Lutyens’s sublime Faubourg d’Amiens Memorial at Arras, which is in an impeccable state despite a need to resolve the drainage of roofs replaced with lead — still proving a problem for Django. All in all, it was a memorable, instructive day for which Gareth and his colleagues received warm thanks from us all.